We have the Radiant Heating System that is right for you. Hydronic radiant heat is traditionally used as the main heat source for an entire home or a large addition. We offer turn-key hydronic radiant heating systems, taking care of all your needs from design through installation. Electric radiant heat is traditionally used to warm floors in bathrooms, kitchens and family rooms. As the leading supplier of Nuheat products in Northern California, we offer complimentary job-site measures in the Bay area and the fastest turn-around time from estimate to delivery. Hybrid radiant heating systems utilize both hydronic and electric radiant heating system to provide customizable and adaptable solutions for your specialized project. We provide concise proposals and pricing for a complete hydronic heating system. We understand that communication is the key to meeting our customer’s needs. We offer on-site consultation followed by a detailed CAD layout. Our CAD design pre-balances the hydronic radiant heating system to increase comfort and system reliability while reducing service issues. We review the designs with you for your approval, ensuring that you are completely comfortable with the layout of the zones, thermostat and mechanical equipment. Design, reliability and energy efficiency is extended into the mechanical room with the highest quality shop-built control panel in the industry. The panel saves space and is pressure tested before installation. There is a two-year parts and labor warranty on all the components of the system. On-site consultations to review the installation methods, venting, manifolds and thermostat placement as well as the mechanical room, structural and zone layout. A custom CAD layout of a pre-balanced system which eliminates balancing valves. Enhanced coverage with up to 50% more pipe than most standard hydronic installations to provide even heat and quicker response times. We only use quality, energy efficient components and installation methods that meet or exceed our customers’ expectations and industry standards. With over 25 years of experience, we know how to ensure that your project is a success. Stand-Alone System - uses a dedicated heat source to heat the water for the hydronic radiant heating system. An additional water heater is needed to heat the domestic hot water. Combined System - uses a single water heater to provide both the domestic hot water and the hot water for the hydronic radiant system. Installation methods are determined by the design of the project or by pre-existing conditions. In some cases, multiple installation methods are used on a project. Slab on Grade Installation – requires minimum R-5 insulation under the slab and on the slab edges. The pipe is attached to the rebar or wire mesh to hold it in place until the concrete floor is poured. This installation method is not suitable for slabs over 6” thick due to slow response times. New Construction - We recommend 1” rigid foam insulation be secured to the existing slab and the pipe is attached to the foam. A topping slab is then poured over the heating system and is protected while the project is completed. Existing Construction – Our installation method will depend on the site conditions, floor heights and build-up. Staple Down – The hydronic radiant heating pipes are attached to the top of the wood subfloor to hold them in place until a light-weight topping slab or dry pack is installed. HeatPly – HeatPly is a premanufactured plywood board with a channel to accept the hydronic radiant heating pipes. It is glued and screwed to the wood subfloor and is 5/8” thick and uses 3/8” pipe. For specifications click here. Engineered floors can be nailed or glued down directly to the HeatPly. Tile floors – usually a cement board is installed. Staple-Up/UnderFloor – The pipe is installed to the underside of the existing subfloor and is usually only installed in remodels. This installation method requires foil-faced insulation to be installed. The interface between you and your heating system has to be easy and intuitive. 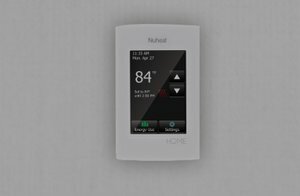 We use WiFi thermostats that seamlessly communicate with our control panel and your smart phone. We map out the mechanical space to accommodate the control panel and the heat source (water heater or boiler) as early as possible in the project. We consult with the contractor to ensure the mechanical space will be able to meet all applicable code requirements and that all the trades are aware of where to locate their services. Water Heater – Primarily used for combined hydronic radiant heating systems and can be fueled by natural gas or propane. We prefer using high-efficiency water heaters for energy conservation and longer life expectancy. For specifications click here. Boiler – Boilers are traditionally used in stand-alone systems. For specifications click here. Tankless Water Heater – We do not recommend using a tankless water heater with hydronic radiant heating systems. Oxygen Barrier PEX Pipe – Pex is used for the floor pipe and the supply return lines. Our systems are pre-balanced by design and the supply and return lines are insulated to contribute to energy efficiency throughout the system. Copper Piping – is used on the control panel and in the mechanical room to connect with the heat source. We only use press fittings to ensure the integrity of the system and to eliminate the danger associated with an open flame on a job-site. Pumps - We use high-efficiency temperature-sensing variable-speed pumps to save energy for our customers. For combined systems, we use a stainless steel pump to move the domestic hot water through the stainless steel heat exchanger. For specifications click here. Heat Exchangers – In a combined system, we use a stainless steel heat exchanger to transfer heat from the water heater to the hydronic radiant heating system. Zone Valves – Zone valves control the flow of the heated water in the system. Our system has an automatic bi-weekly exercise function to ensure the valves and pumps remain in a ready condition. Manifolds - The manifolds we use are full-port to increase the flow of the water by 22%. We pre-balance the system in the design phase to eliminate balancing valves on the manifolds. The advantage to the builder and the homeowner is that access to the manifolds is no longer required within the living area of the residence. Thermostats – WiFi enabled thermostats sense the ambient temperature of the room and will start or stop the flow of the heated water depending on the set-points programmed by the homeowner for maximum comfort. For specifications click here. Topping Slab – A topping slab is a light-weight concrete product that is self-leveling, thermally conductive and maintains a 2-hour fire rating with sound deadening properties. An engineer must design the loads when it is being used on a raised wood subfloor, as it weighs 15.5 lbs. per square foot at 1 ½” depth. Let us help streamline your project by calling us for a complimentary site measure or, send us your plans and we will send you an estimate and layout drawings. A custom CAD layout with a pre-enginered heating system to eliminate cold spots. Wifi-enabled with remote access via IOS and Android apps with a display that also provides energy usage and outdoor temperature. Similar to the Signature thermostat without WiFi capability, energy usage and outdoor temperature data. If you want to replace your Harmony thermostat with a new Signature or Home model, we offer a customizable Harmony Retrofit kit. This is a fast, clean, and stylish option for upgrading your thermostat. The Harmony retrofit kit is made for a 2-gang box and will not fit with larger boxes. There is a 3-year manufacturer's warranty on the thermostat. We also recommend a certified electrician connect the thermostat. There are many different kinds of electric floor warming products and installation methods available. We only use quality products and recommend installation methods that meet or exceed industry standards. Mats – The mats are pre-engineered and do not require any on-site adjustments. They are available in both standard and custom options. We recommend custom mats as they provide 100% coverage - without any cold spots. Cables – Cables are available in standard lengths and the layout is configured on-site by the contractor. Mats – The mats are only 1/8” thick and are embedded into acrylic modified thinset directly over the prepared subfloor. In wet locations, such as showers, the mats are installed over the water-proof membrane using acrylic modified thinset. Place the Nuheat Mat into fresh acrylic modified thinset to create 100% contact between the mat, thinset and subfloor. Secure floor sensor probe between heating wires. Apply a layer of thinset and install tile/stone flooring as per manufacturer's instructions. Cables & Membrane - The membrane is pressed into acrylic modified thinset and the cable is snapped into place. 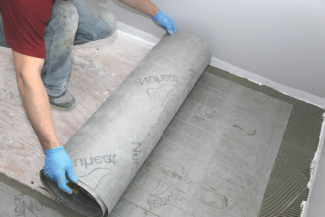 Roll Nuheat Membrane onto the thinset mortar and press with a roller or a flat trowel. Lay down the next sheet and align it with the previous one without overlapping. Line up the pillars to facilitate the installation of the heating cable. Snap the Nuheat Cable into the Nuheat Membrane. Apply an additional layer of thinset mortar on top using a notched trowel suitable for the tile type/size.